Say hello to Piepmatz, a Twitter client for Sailfish OS! Piepmatz supports all the features of Twitter that you need to stay up-to-date. Your personal timeline, notifications, media etc. - coming with a lot of eye-candy! Piepmatz is and will remain Open Source Software under the conditions of the GNU GPLv3. However, in order to support the development of Piepmatz, we'd like to ask you for a contribution - you could also call it royalty - before you can run it after a trial period of 14 days. As mentioned, you have a testing period of 14 days after the first run of Piepmatz. Take your time to test the application and ensure that it fulfills your needs and that you really like it. There are no limitations to the software during this time - simply press the button "Continue Testing" on the initial screen. If you decide to purchase a contribution key in order to keep on using Piepmatz beyond the testing period, please choose a contribution type. You have the choice between 4 different contributions: S, M, L, XL. No matter which size you choose, the purchased key will unlock the the complete application after the trial period. It's up to you to decide how much the app is worth to you. Moreover, feedback about Piepmatz is always appreciated (good, bad, improvement/feature ideas etc.). As mentioned, you can contribute with a translation, a new feature or even a bugfix. The sources are on GitHub at https://github.com/Wunderfitz/harbour-piepmatz. Please acknowledge the GNU GPLv3 before contributing/forking. Thanks to all new and especially to the existing contributors! I have an Xperia XA2 and unfortunately the tweets are displayed twice. Also 3. Hi, thanks for the great app! Is it possible to have an option to show previous mesages older than 30 days? I like looking back at old messages sometimes. Maybe an option for < or > 30 days? I don't use Twitter that intensively, but I want to get notifications from a few accounts I follow. Does Piepmatz forward notifications from subscribed/followed accounts? So far, there are only notifications for mentions, retweets and new followers. Ok, thanks for the info. Is there a difference between the OR and Store versions? Still works smoothly here. Any error messages? Yes: "404 not found" and "Please follow someone to see their tweets". Probably a Twitter issue yesterday evening, as it seems to be normal now. Would you do an auto refresh by example 5 minutes or another specific time? Thanks for supporting OS! Please see my comment on https://github.com/Wunderfitz/harbour-piepmatz/issues/40 - I haven't implemented it yet as there is no better positioning-after-reload so far. Once I implemented that, also the auto-update will come. Simply subscribe to the issue and get an update once I work on it. Your digistore24 link seems to be down, I check the agreement and no payment options appear. Mhmm, that's strange. Please try the links on https://werkwolf.eu/piepmatz.html (scroll down to the bottom). 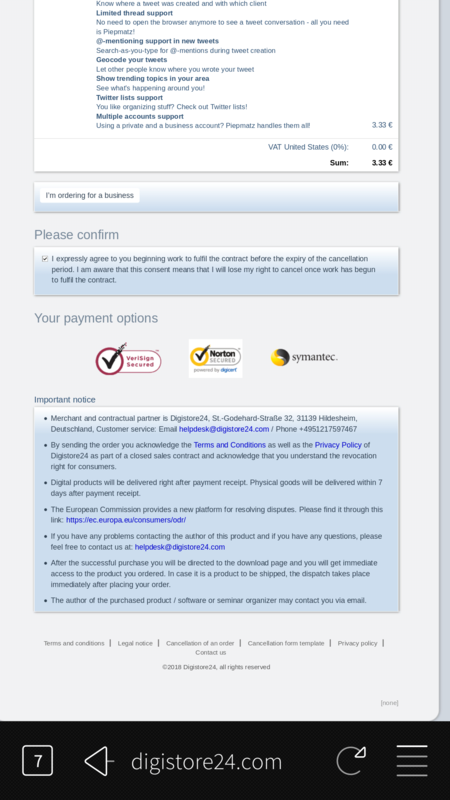 If it still doesn't work, please send me a screenshot of the missing payment options. the three security links are all dead, too. Or did we pay for the app just for few months? These changes are known since about a year or so. Therefore, Piepmatz was designed to work without adjustments even after Twitter deprecated these API endpoints. So, Piepmatz handles it already now and will work also after August 2018. Oh....looks like I was stumpling upon an outdated newsfeed ;). Android resp. Google is not my friend and will never be my friend.... So I just thought it will be another reason to keep my bad opinion about this company resp. this OS. Thanks for clarification. Thx werkwolf. I'll give it a try. Could you give the home.buttom a bit of love :-)? Press home once should bring you to the top (implemented). But if you hit home again on top it should start refreshing the timelime. More comfort to use. Thx for your work (paid app support, piepmatz, wunderfitz). Thx for the update. But since upgrading reapplying the alternative theme is working but not for the app icon in app drawer. it won't get changed. Piepmatz issue? For the app icon, you need a patch as it's not allowed to change the app icon from the app itself. Probably, you only need to reinstall the theme patch from Ferlanero. werkwolf. A possibility to refresh threads instead going back to timeline and reenter the tweet / thread would be very nice and useful. Atm I have to go back and back to the thread to see new comments. Thx for this feature rich client! Thanks! I'll put it to the list for future updates.